A 75-year-old woman experienced sudden onset dysphagia 2-3 weeks ago and hoarseness 4-5 days ago. Physical examination reveals two thyroid masses. One is superior to the right lobe and measures 3 cm. The second appears to be goitrous involvement of the entire right thyroid lobe with left tracheal deviation. In addition, there is a hard 2 cm right cervical lymph node. The aspiration smears are abundantly cellar and demonstrate pleomorphic epithelioid and spindled cells, some of which are giant forms, in a degenerative, inflamed background. 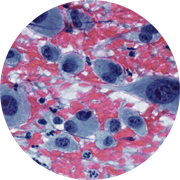 Immunoperoxidase stains show that the malignant cells are positive for panCK, Cam5.2, and vimentin and negative for thyroglobulin, TTF-1, Napsin A, RCC, CD45, CD30, and Ca19-9. The FNA cytology is diagnosed as anaplastic carcinoma.